Oman’s Sohar Aluminium has partnered with Synergies Castings, a leading Indian manufacturer of aluminium alloy wheels, to set up a new $100 million manufacturing plant in the sultanate. Synergies Castings is a leading non-ferrous component company, manufacturing four-wheeler alloy wheels, aluminium castings, and plastic components. As one of the global leaders in the manufacturing of chrome-plated wheels up to 24-inch in diameter, the company supplies alloy wheels to most international automobile makers including General Motors, Ford, Chrysler, Honda, Toyota, Tata Motors, Mahindra and Fiat. As per the deal, the duo will set up a hi-tech alloy wheel manufacturing plant in the Sohar Industrial Estate adjacent to Sohar Aluminium premises. The construction is scheduled to begin in the coming months with production expected to commence in 2020, said a statement from the company. “With this agreement in place, we will meet our goal of supplying 60 per cent of our hot metal production to downstream partners,” he stated. “We are offering them proximity to raw materials, a significant value proposition that provides our downstream customers with a distinct energy cost advantage. This initiative is also in sync with our intent to build beneficial relationships with local suppliers as well as customers from Oman and abroad in order to deliver sustainable in-country value (ICV) for Oman,” he noted. In line with the Tanfeedh programme, the new Synergies plant will contribute to Oman’s economic growth and create new forms of employment for high skilled talent. Once fully operational, the plant will produce around two and a half million wheels annually with an estimated 500 direct jobs created, he added. The alloy wheel segment is estimated to hold the largest share in the global aluminium downstream usage market. Last year, the automotive wheel market, which was worth $32 billion, is projected to reach $50 billion by 2025. With increasing international demand for alloy wheels, this project will further develop the manufacturing industry in Oman, it said. 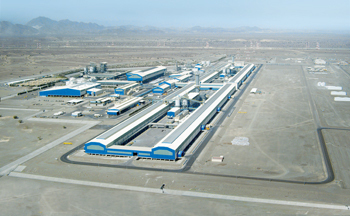 “With Sohar Aluminium as a supplier, our expansion in this region will further help us deliver quality around the world,” he added.